As seen in Vernon Events Magazine. What distinguishes Vernon’s own chorale from other area community choirs and groups? The Vernon Chorale commits to fostering young talent through its Fellowship Programs. Over the past decade the Chorale’s Conducting Fellowship evolved from word-of-mouth recommendations for an assistant conductor to the excellent teaching tool it is today. The program aims to sharpen skills of aspiring conductors both in concert preparation and performance in a practical setting. Throughout the season, the Fellow is guided by the Artistic Director and plans and conducts the Chorale’s June concert. Because of the program’s rise in popularity, the pool of local candidates has widened, the number of applicants increased, and a formal application process put into place. Another key factor is a conductor willing to share the podium in order to cultivate the next generation of local talent, and a group of choral singers willing to support the Fellow’s growth. The Vernon Chorale is proud of retaining both. Ehren Brown, current Artistic Director, honed his skills under the program. The Chorale is excited to welcome Vernon resident and 2005 Rockville High School graduate, Liz Bologna, as their 2017-2018 Conducting Fellow. Growing up, Bologna watched her parents sing with the Chorale and is no stranger to the group. 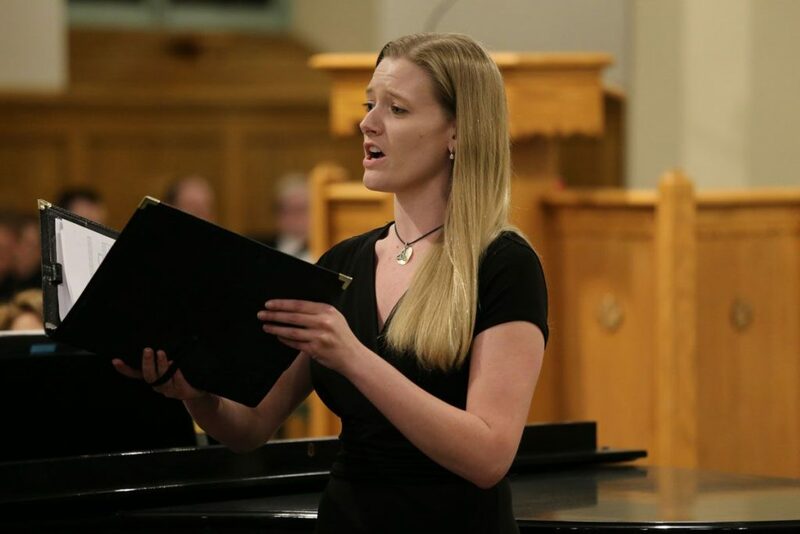 In 2006-2009 she was a Choral Fellow, another Fellowship for young aspiring singers, and continued singing with the group through 2011. When asked what excites her most about her role as Conducting Fellow she replied, “I’m humbled to be a part of the Vernon Chorale’s legacy of bringing great choral music to the community.” Both Brown and Bologna exemplify the Fellowship’s unique ability to give back to the community by contributing to future conductors, thereby furthering both performance and appreciation of choral music in the Vernon area. The Chorale’s Winter concert is Saturday, December 9, 7:30 p.m. at St. Bernard Church in Rockville. Visit VernonChorale.org for upcoming performances. Member Vernon Volunteers’ Collaborative.